Traveling Tailors Itinerary - visiting major US cities; Dates into March 2019 include Los Angeles, Philadelphia, Orlando, and New York City, San Francisco, Miami, Dallas, Houston, many Others. New York, NY, January 10, 2019 --(PR.com)-- My Custom Tailor has its Travelling Tailors visiting major cities with all new fabrics this 2019. To prepare for the new year, many are looking to improve upon or revamp an existing wardrobe; My Custom Tailor accepts this challenge and aims to provide its customers with the best quality, best fitting clothes. By attending one of the Roadshow events by My Custom Tailor, customers can meet with Master Tailors for personal one on one, no-obligation consultations, get measurements done or place an order for perfect fitting custom clothes. In order to make the process as accessible as possible, in addition to the Roadshow Itinerary, My Custom Tailor is also offering personal visits to homes or offices. If you are unable to make it out to one of the Roadshow venues, you may request a personal visit to your office or home from My Custom Tailor Master Tailor (subject to availability). The tailor will take over 50 custom measurements for a truly bespoke fit given to their hand made garments. Sizes are taken for men's suits, custom shirts, women's suits and shirts, coats and more. All clothing is then custom made by expert craftsmen and tailors in Hong Kong and shipped directly to the doorstep of the customer. Old world traditional customization and service is given in a new age setting. Those interested can select from the city of their choice and click the box to make an appointment. 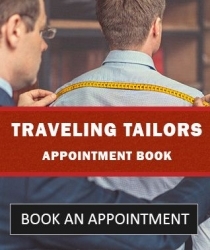 Alternatively, you can also click on the Contact Us link at the bottom of the homepage at www.MyCustomTailor.com and email them the following information: City, Date and Time to book the appointment. Refer a friend, colleague, co-worker or bring him/her along to the appointment and get a complimentary custom shirt with your order when they place an order. These are are "By Appointment only" events. Clients can make their appointments with the travelling tailor here.